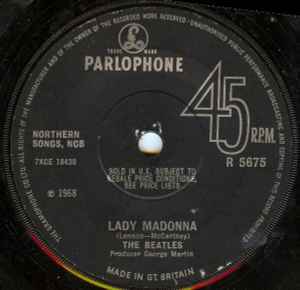 Initial pressings came with a two-sided flyer promoting the 'Official Beatles Fan Club' on one side and the monthly magazine 'The Beatles Book' on the other. New members joining the fan club received a giant colour poster of the group taken during the singles recording session. There is also a contemporaneous version with a 4 prong centre. Jayfive, e-kartoffel, SeRKeT, Phono_Mode, YankeeDisc, LPJones, gboe, IvenFaint, DiscogsUpdateBot, The_Beatles.